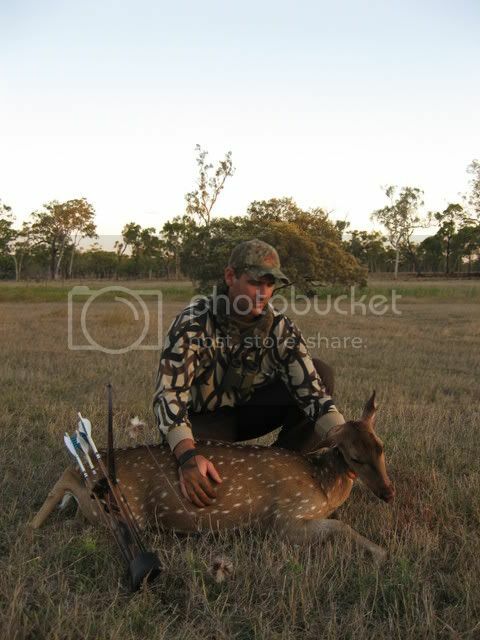 Aussie Axis (Chital Deer)...my Highlight! Thought I'd post this up as it was my hightlight! Re: Aussie Axis (Chital Deer)...my Highlight! Yeah, I was wrapped when I read you got her, Al. Many happy returns of the day to you. That's a highlight for sure! We have those here in Hawaii and boy are they extremely hard to stalk. Taking one with a longbow is very impressive! You got some skills! Good going Al! Great stuff Al! That was a great story to read! Nice deer, very well done! Cheers fellas, it was a long time comming. Well done Al a Fine Chital and some great meat for the freezer. Way to go Al. Axis deer are one of my to get animals. hows the meat on those deer mate? good for you, Al! Those things sure are pretty. I bet they taste great too!